Driving - or more relevantly - crashing is getting safer. 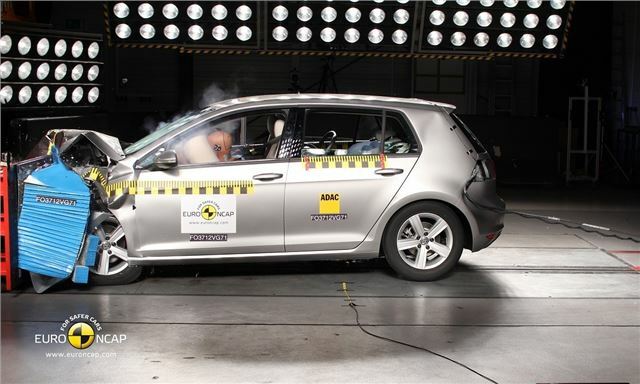 EuroNCAP's latest round of tests features 15 cars, with only one car, the Dacia Lodgy, falling short of a maximum result, scoring three out of five. The cars tested were the Dacia Lodgy, FIAT 500L Ford Fiesta, Ford Kuga, Hyundai Santa Fe, Mercedes-Benz A-Class, Mitsubishi Outlander, Opel (Vauxhall) Mokka, SEAT Leon, the Skoda Rapid and its twin, the SEAT Toledo, Subaru Forester, the new Range Rover, Volvo V60 Plug-In Hybrid, and the seventh-generation Volkswagen Golf. The near clean-sweep is an impressive result, a clear indicator that family cars are getting stronger in the face of tougher NCAP testing, introduced in 2011. The fourth generation L405 Range Rover proved that its weight-loss programme, scoring well across all areas - but that has not stopped its maker promising an improved head restraint to bring whiplash protection in line with expectations for a car of this quality. In the middle-market sector has produced some astonishing results - the Volkswagen Golf set a new benchmark by including several advanced driver assistance technologies,such as Multi Collision Brake system, Front Assist and Proactive Occupant Protection, as well as Lane Assist. The Mercedes-Benz A-Class and Ford Fiesta were also highlights of the five-star scorers - receiving Collision Prevention Assist and Attention Assist as standard equipment, with PRE SAFE available as an option. Ford's MyKey system (which allows owners to limit the speed of their car for other drivers) was also marked up for being a significant development. The Dacia Lodgy's three-star rating is a disappointment, especially considering that parent company, Renault, is such a driving force in vehicle safety, and the EuroNCAP test in particular. In the frontal impact, the Lodgy perfomed like a car from the 1990s - the screen pillar was heavily deformed and the roof ended up bent in front of the B-pillar. It also lacks an electronic stability programme. But as a car sold heavily on low price, it will be interesting to see whether this affects sales. You can view all of the crash test videos (including all cars tested since 1997) on EuroNCAP's YouTube channel.